'Enhanced Maturity' is a new area of viticultural research. We stumbled across this phenomenon in one of our powdery mildew trials in 2010-11 using Protector and potassium bicarbonate and have continued to research it since then. an adjuvant with the right properties to spread, penetrate and dry the potassium salt on the berry surface at a rate to facilitate interaction. A handsprayed trial at Sileni Estates, Te Awanga looking at the efficacy of pre formulated Protectorhml and potassium bicarbonate against powdery mildew on grapes ended up with several treatments showing remarkable resistance to botrytis, sour rots, with enhanced maturity (higher brix, thickened skins and enhanced colour), in what was a highly challenging season. The graph shows Brix and berry weight. The red bar treatment developed into HML32. A large national machine sprayed grower trial programme using a tank mix of the ingredients at two water rates and two potassium bicarbonate rates. 28 growers were involved. An effective transition between the two seasons was not made with many of the previously measured enhanced maturity indicators not repeating themselves. A hand sprayed trial was undertaken on Chardonnay at Monowai in Crownthorpe which again exhibited positive enhanced maturity indicators. The graph shows increased Brix alongside pH, TA and berry weight results. A machine sprayed trial on Gimblett Gravels Merlot looking at a range of potassium bicarbonate rates and different timings based on days before theoretical harvest. The enhanced maturity indicators of increased brix, thickened skins, heightened colour returned. The successful treatment was HML32. A presentation was given to the Gimblett Gravels Technical Workshop and can be viewed here. Based on the successful treatment and timings found in the 2013–14 trial, 18 full size commercial machine sprayed trials were planned comparing wines made from adjacent treated and untreated blocks with conventional wine making methods. 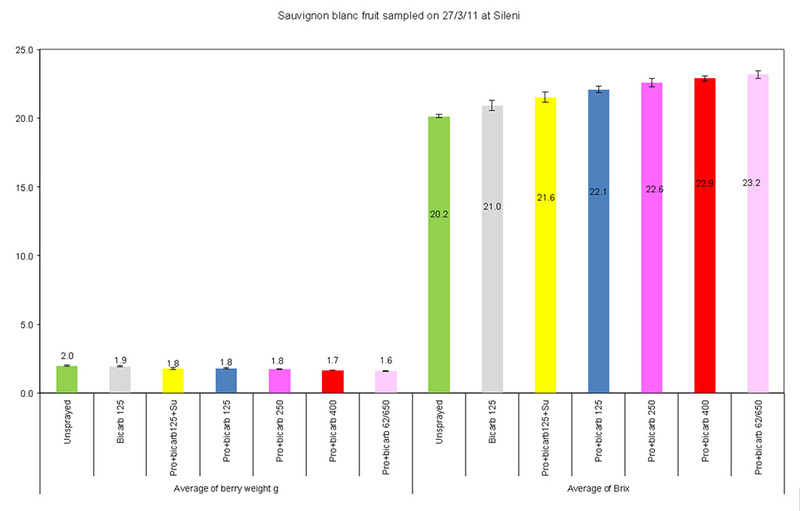 However, only one vineyard exhibited the enhancement expected (2 brix improvement from 2 applications) and the intention to compare wines was abandoned. Further work was required on the timing of the application of HML32 to produce a reliable result. A large handsprayed study on three varieties in Hawke's Bay to better identify the application timing that produces enhancement effects. This is reported in full below. While we didn't know it at the time, the 2010-11 trial aligned with scientific study already underway in California to enhance the maturity of table grapes. Potassium bicarbonate was included in the last season of that study and was the best performing potassium salt for the effects of increased brix, heightened colour and 'thicker' skins. This study was presented at the US Table Grape Commission conference in 2012 (Joseph Smilanick and others). It is accessible here. Scientific study has continued in Israel where the 'mode of action' of this phenomenon was established in respect of specific potassium salts as mild desiccation (water loss) engendering the plant to replenish with a full nutrient stream – hence 'enhancement'. That study was reported by Amnon Lichter and others - Scientia Horticulturae 187 (2015) 58-64. A large handsprayed trial was undertaken on Chardonnay, Merlot and Syrah in Hawke's Bay (Triangle) to determine the most effective application timing to achieve enhanced maturity effects. There were three sets of treatments (HML32 and HML Silco sprayed once, HML32 alone sprayed once and HML32 alone sprayed twice 10 days apart). Treatments were applied every 5 days from the lag phase (approximately 13 January 2016) and continued through veraison to harvest. For the timing that produced the best enhanced maturity indicators for each treatment set, the crop was harvested and wines were produced. The aim for this trial was to harvest the crop for the untreated control and each of the three treatment sets at the same brix, being 22.5 as the commercial harvest target. The best treatment (HML32 sprayed twice) was harvested 14 days before the control at 23.5 brix. The other treatments (HML32 sprayed once and HML32 with HML Silco) were harvested 7 days ahead of the untreated control. The timing of these applications was around 80 and 91 days after 5% flowering. All treatment sets for these varieties were harvested all on the same day. The treatments for the Merlot ranged from a &half; Brix ahead to two Brix ahead of the untreated control. The Syrah treatments were about all about &half; Brix ahead of the untreated control. Both results were rain affected, but perhaps also affected by the different cropping regimes for each. The Merlot was cropped to the maximum perhaps 16t/ha whereas the Syrah was heavily crop thinned after veraison to enhance juice quality. A penetrometer was used to measure the force required to depress a berry by 2mm – a method which could be used as a proxy for berry thickness. 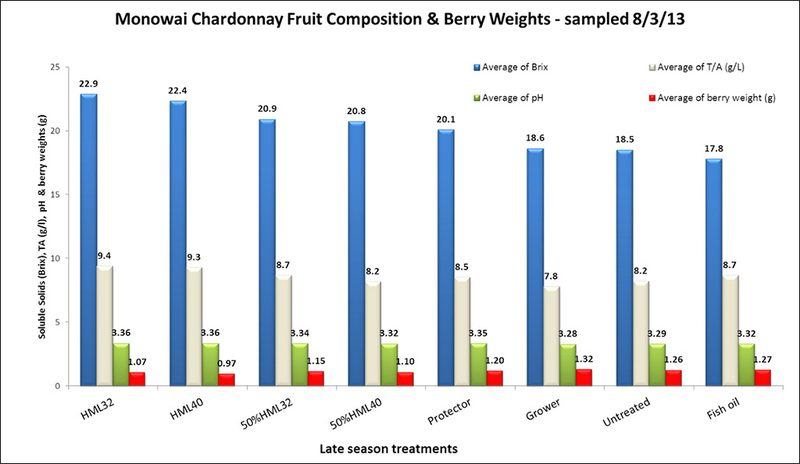 This study was undertaken in the Chardonnay with large berry samples (12mm-13mm diameter) over one replicate of all the treatments. The study demonstrated that the treatments with enhanced brix were also firmer, and this later translated in much higher end of season botrytis resilience. It is noted that the application timings in this trial are specific to those varieties in that vineyard in Hawke's Bay and that it will vary in other areas. Considerable time and effort has been expended professionally reviewing historic phenological and climatic data related to the trial site with the aim of providing a formula to make reliable judgements regarding other varieties and other growing regions. Several concepts/timings have been examined to assist growers to ascertain the likely best spray time/timings, such as 5% flowering, establishing the lag phase, counting back from a theoretical harvest date, brix accumulation and veraison. These timing constructs are problematic due to the variability from year to year. Dr Rob Agnew, Plant and Food Research, reviewed historic phenological and climatic data relating to the trial site with the aim of providing a formula to make reliable judgements regarding other varieties and other growing regions. Various plant stages were considered including the ones described above. After all issues were considered, the stage that is most recommended is 50% veraison, defined as 50% softening of berries or 8.5 Brix. This growth stage has a number of advantages: it is close to when applications are required, there is a good history of the 50% veraison timepoint by region and by variety, and growers for the most part have access to it in real time. It is also something growers can individually make a judgement call in relation of their own crop and location in respect of data produced close by them. If sprayed twice - the first application to be at 50% veraison followed by another application 10 days later. If only going to apply once - apply 10 days after 50% veraison. If sprayed twice - the first application to 7 days after 50% veraison followed by another application 10 days later. If only going to apply one - apply 17 days after 50% veraison. To achieve enhanced maturity effects, the application needs to be focused at the bunch line only, not bunch line and canopy. There is no effect transfer from leaf to berry and limited transfer within the bunch. 12 microvin wines were produced from the trial, over the three varieties. (An untreated control and the 3 most enhanced treatments from each of the treatment sets). These were undertaken by EIT (Eastern Institute of Technology) and overseen by Ant Mackenzie, a senior Hawke's Bay consultant winemaker. This is summarised in the Wine Evaluation report as well as in the full report. The same application timings that produced the enhanced maturity effects also produced efficacy against end of season botrytis... This video demonstrates the efficacy in the Merlot trial. The full report includes a botrytis assessment in the Syrah trial. The last five years has enabled us to refine the timing of HML32 applications to achieve enhanced maturity - to allow earlier harvest or enhanced juice quality. It is now up to the viticulturists and winemakers to consider how this tool can help them produce better quality fruit and wine and to trial it themselves. Please feel free to contact us if you want to discuss how you might go about this. Our efforts from this point will be to focus on the end of season botrytis control as a result of 'enhanced maturity' treatments.